The most effective way of learning is none other than visual and voice tutorials. 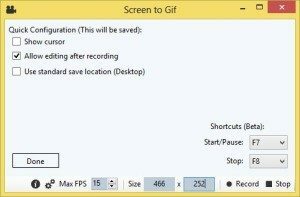 ScreenToGif for creating GIF Files is of the tools and application that can capture the PC screen and later convert them to videos in many different formats. Other popular ways are to take a screenshot of works that you are doing on the computer. ScreenToGif is something like we, publishing the series of screenshots of any software reviews or tutorials or even for How-to’s rather than making you read long and lengthy articles. Sounds exciting! Isn’t it? 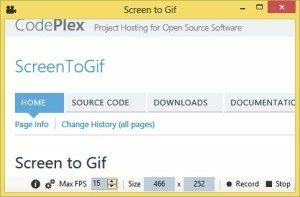 Today, I will introduce you with an awesome freeware Windows ScreenToGif app that allows you to record a selected area of your screen and save as an animated GIF. It can record your screen activities and save directly to a gif looped animation without any third party application. During the process you can pause and continue the program any time later can easily modify or remove the unwanted frames to generate better GIF with ScreenToGif. This is a portable app and has size in just a few KB. On the main interface of a screen, you can set Max FPS and dimensional size of GIF that you want to record and generate. Finally, click on the Record button to start the recording and start working. 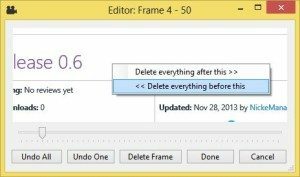 After finishing the work click on Stop button to stop the recording process and ScreenToGif will prompt you one small editing screen where you can manage all the recorded frames. After finalizing the editing, click on Done button and save the GIF file at any location. ScreenToGif will take some time it depends on your recording work to generate the animated GIF file. Finally, you will able to see generated animated GIF file in action. ScreenToGif also supports some standards tweaks that you can apply like you can set function key to work during the recording to Start/Pause and stop, enable cursor, allow editing after recording and save standard location (Desktop) to save animated GIF files.